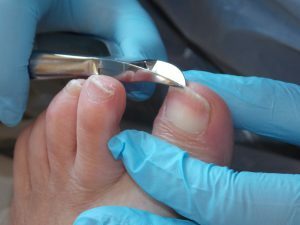 What is the cause of an ingrown toenail? An ingrown toenail can be swollen and tender but can eventually become increasingly painful, red and infected. Your skin may start to grow over the edge of the nail plate. This excessive growth of skin is called hyper-granulation tissue and can easily bleed if bumped. What should I do if i have an ingrown toenail? Click here to listen to Madeleine explaining treatment options for ingrown toenails.